Both the houses of the Parliament were adjourned within 10 minutes of convening amid protest by the Telugu Desam Party (TDP) MPs demanding 'Special Category Status' for Andhra Pradesh. The Lok Sabha was earlier adjourned till 12 noon and the Rajya Sabha till 2 p.m. 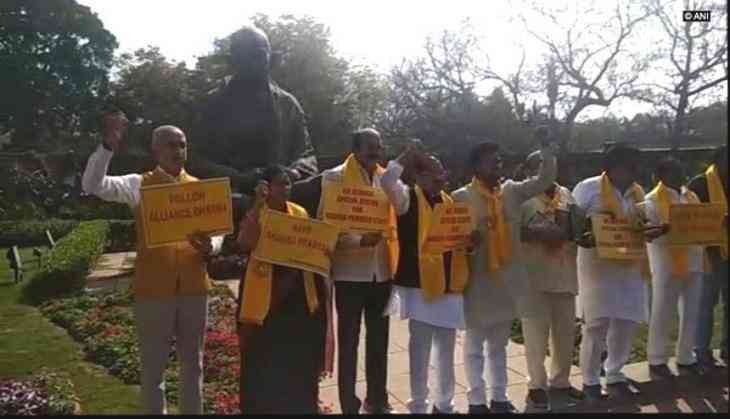 Ahead of the commencement of the second part of the budget session, the TDP MPs staged the protest in front of Mahatma Gandhi statue in Parliament premises demanding 'Special Category Status' for Andhra. The MPs were holding placards with slogans like, "Listen to the voice of five crores AP people", "Save alliance dharma". TDP MP Jayadev Galla demanded all the promises made earlier related to the Andhra Pradesh to be fulfilled. "We want special development package for the backward district, we have received a very small package, but that is not enough, we want it on the basis of per capita income. We also want industrial incentives in line with other hilly states," Galla said. Interestingly, TDM MP Siva Prasad dressed as Lord Krishna during TDP protest here. The decision to grant SCS was announced in the Parliament and endorsed by opposition parties, including BJP in 2014. SCS was announced in lieu of foregoing Hyderabad, which houses employment generating industries, and such a precious clause should not be foregone for some insignificant package.